This is the lightweight back massager with a superior ergonomic design that makes it easy to pinpoint aches and pains in the back. 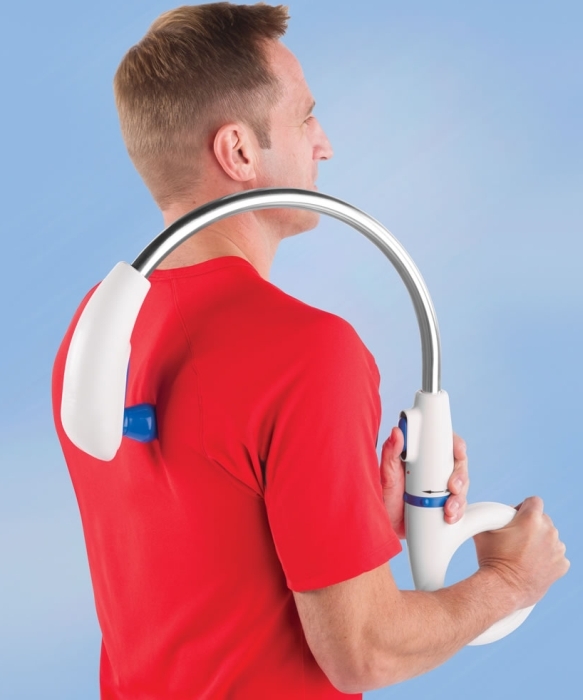 Eliminating the need to contort the body in targeting hard-to-reach areas of the back, the massager is held in front at waist or hip level while its curved arm arches around the shoulder. The massaging “ball” head is placed in the ideal position for relieving tense neck, shoulder, and upper back muscles; simply lifting the handle to chest level enables the massaging head to reach the lower back. Controlled at the handle, its dual-speed motor provides 4,500- and 5,500-rpm oscillation, ideal for light relaxing pressure or penetrating deep massage. Includes three additional massage heads: a “point” for precise trigger point release, “knuckle” for multiple knots in the same area, and a “palm” to help promote circulation.